1.7 How to Apply for TSLPRB Constable Recruitment 2017? TS Police Recruitment 2017 Notification is going to declare soon. Apply online for 18,290 Telangana Constable Jobs before the last date. Further details of Telangana Police Notification such as TSLPRB Vacancy, TS Police Constable Eligibility, Telangana Police Online Application are mentioned in detail below. TS State govt on 23rd July 2017 has come out with the announcement regarding the TS Police Recruitment 2017. Very soon, Telangana State Police Recruitment Board is going to issue the Telangana Police Constable Notification 2017. It is expected that the TSLPRB Constable Notification 2017 will be issued for a total of 18,290 Vacancies. So, TS Govt jobs Aspirants can grab this latest Opportunity released under Police Recruitment. Very first, Govt of Telangana has taken the decision to release TSPSC Police Recruitment Notification 2017 through TSPSC. But, the TS Govt in association with the Police Recruitment Board has taken the complete charge over the Telangana Police Recruitment Notification 2017. 10th /10+2/Inter/Graduation completed individuals are eligible to apply for this www.tspolice.gov.in Recruitment. Candidates Age limit should be 18 years to 30 years to be eligible for the TS Police Constable Vacancies. Till now, there is no official notification regarding the TS Police Constable Notification 2017. After the official announcement, we will update the official advertisement on our entranceexams.io portal. Here is a good news for all the unemployed youth of Telangana state. The Telangana Government is going to release a TS Police Notification 2017 for filling the vacancies of 11000 Constable posts in various departments. Candidates who were looking for Police jobs in Telangana must utilize this opportunity. Recently, DGP Anurag Sharma, Rachakonda Commissioner Mahesh Bhagavath, Transport Minister Mahender Reddy and other MLAs have started Adibatla Police Station in Ibrahimpatnam. So, to fill the vacant positions, the officials have decided to conduct a recruitment drive for appointing Constables. These 11,000+ Telangana Police Jobs are divided into various categories like civil, armed reserve, special protection force and others. Hence, the candidates who wish to work in their native state must utilize this opportunity. The Telangana State Level Police Recruitment Board has recently made an announcement regarding the recruitment of these Constable vacancies. There is not any official notice but rather the declaration turned through a publication in a daily newspaper. Hence the authorities of TSLPRB have notified all these details in the news only. 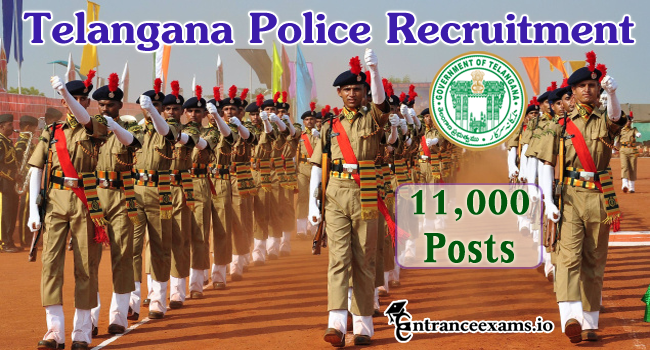 Since the vacancies introduced in this Telangana Police Constable Recruitment 2017 are 11000, officials are expecting some lakhs of applications in response to this notification. Also, the Telangana Police Notification 2017-18 release date is not confirmed so far. So, whenever the officials release the notification of these 11000 TSLPRB Constable posts, we will update the same on this page. Hence, I advise you keep visiting this page regularly for more updates regarding this Latest TS Police Recruitment 2017. Out of these 11000+ Telangana Police Constable vacancies, 33% are reserved for women. The vacancies provided here may increase or decrease as per the norms. Also, these vacancies are reserved for various regions. The board members will mention all these details such as locations of these vacancies in the official notification. Candidates must follow this 11000 Telangana Police Constable Jobs 2017 to get a job in Telangana Govt. So all the aspirants need to be ready to use this TSLPRB Police Constable Recruitment 2017 quickly. For more details, visit the official website www.tslprb.in. Also, check 20,000 Teaching & Non Teaching Posts in Telangana. The Eligibility criteria of Telangana Police Recruitment 2017 specify the age limit, educational qualification, and nationality of the candidates. So, before applying for this notification, one should read the eligibility criteria of TS Police Constable Recruitment 2017 thoroughly to know whether they are eligible or not. However, age relaxations are applicable upto 5 years for reserved categories as per the rules of the Telangana government. Candidates applying for this Telangana Police Constable Recruitment 2017 must have completed 10th class/ 12th class/ Graduation from a recognized board with knowledge in the relevant trade. If you found ineligible for this TS Police Recruitment 2017, don’t worry; you can check other TSPSC Notifications such as 2506 Revenue Department Jobs in Telangana here. Before applying for these 11000 Constable posts in Telangana state, all the aspirants must be aware of some details such as Selection Procedure, Pay Scale, Application fee, etc. So, for your convenience, I have given all these details of Telangana Police Constable Recruitment 2017. So, let’s have a look at these details in the below sections. Candidates applying for this Telangana Police Constable Recruitment 2017 will be selected based on their performance in the following rounds. All the selected candidates of TSLPRB Constable Recruitment 2017 will get a pay scale of Rs. 5,200 to 16,400 with a GP of Rs. 1,900/-. General/ OBC category: Rs. 400/-. SC/ ST/ PWD category: Rs. 200/-. Also, check TS VRO VRA Notification 2017 here. How to Apply for TSLPRB Constable Recruitment 2017? First of all the candidates should go through the official site link, i.e., www.tslprb.in. Scroll down the homepage and search for Telangana Police Constable Notification 2017. Now click on the TS Police Online apply link for 11000 constable vacancies. Moreover, it will redirect to the online portal. Now fill all the required fields in the application form with correct details. Upload the scanned copy of passport size photograph and signature as per the given format. Check once again for all details filled are correct and accurate. Now click on submit button; it will redirect to the payment gateway. Pay application fee using online banking/ Credit card / Debit card. If you found this article about TS Police Recruitment 2017 was helpful for you, please do share with your friends. Moreover, if you have any doubts, feel free to ask your queries in the comment section below. Our team will reach you earliest and solve it for sure. Also, Stay tuned with our www.entranceexams.io site for more details about all Entrance Exams, State, and Central Government Jobs in India.